GETTING INTO GAME SHAPE. Front, from left, Gavin Eckler, Michael Mouawad, Isaac Alshatti, Isaiah Horne, Koby Hart, Najee Mosley, Jordan Lopez, and Diego Jimenez. Back, from left, Allias Williams, Luc Peifer, Isaac Mendez, Joshua Jastraub, Jacob Horne, Drew Szalay, James Smith and Jamaal Barnes. LA VERNE, California, November 10, 2017 — The early college pre-season news hasn’t been good. Three UCLA basketball players have been detained in China on the suspicion of shoplifting sunglasses from a Louis Vuitton store. Their plight could upend UCLA’s season before it even starts. You would think all players would know the rules (keep your hands in your pockets), especially when representing your country and college overseas. 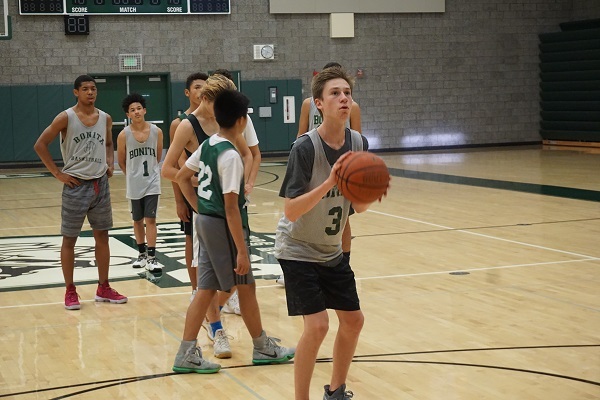 However, Bonita varsity basketball coach Tim Godley doesn’t think it’s necessary to lay down a bunch of rules for his players that they should already know. Josh Jastraub concentrates on making a free throw. If he misses, the entire team runs another suicide. No pressure! the second, and 9-1 last year, including a league title. Overall, his three-year record stands at 70-21. Frankly, Godley knows his team has character; what he has doubts about is how is going to replace the 45 points a game that walked out the door with the graduation of his three scoring leaders, led by two-time league MVP Joe Quintana, now plying his craft for Loyola Marymount University. Godley’s squad this season will be balanced among seniors, juniors and sophomores (there are no freshman), so new players will be asked to pick up the scoring slack. How they respond to the challenge will play a large part in Bonita’s success. “We have some younger players who are going to see a lot of minutes, so that’s always the question mark going into the season,” Godley said. Besides balance, Godley likes his team’s foot speed, work ethic, chemistry and ability to put the ball in the basket. “These kids are pretty capable,” Godley said. Capable of winning another league title? “That’s always the goal,”Godley replied. 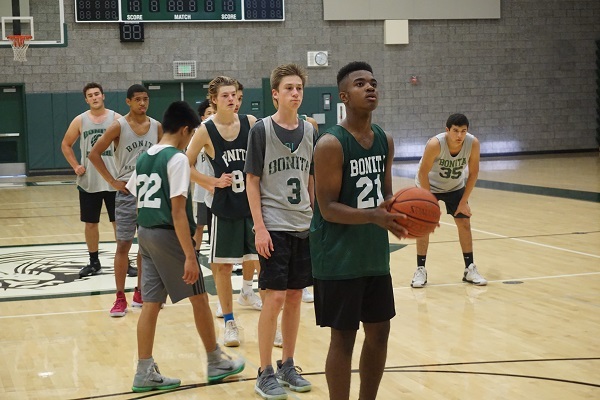 A trademark of Bonita basketball is pushing the ball up the floor before transitioning into a flex offense, which features lots of cuts, screens and picks across the key. They’ll also press a lot. 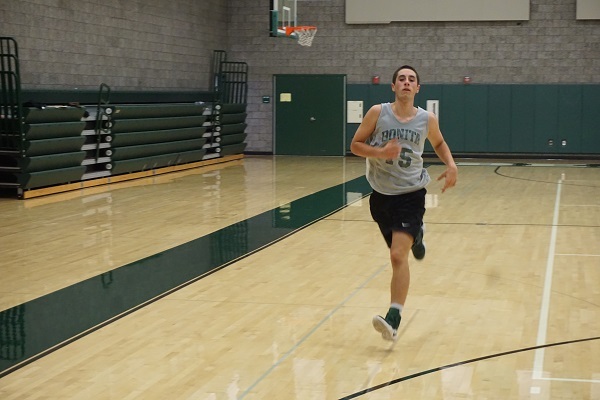 Drew Szalay sprints to the baseline. “I’m not going to give away all my secrets,” Godley said. Godley came to Bonita from Master’s College in Santa Clara, Calif., and before that he taught five years at Maranatha in Pasadena. He walked on as a player at Azusa Pacific, so you know there’s fire in his belly and an over-achieving mentality that you just can’t teach. 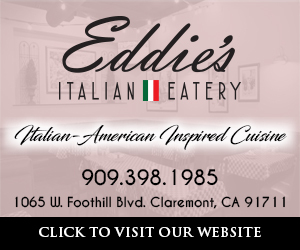 Godley also has also met or been mentored by some of the best, coaches like Brian Beauchemin of Glendale Community College, Tom Hofman at La Canada High, Mike le Duc at Damien, Chuck Martin at Master’s and Cliff Hamlow at Azusa Pacific. Those influences aside, it’s now Godley strictly running the show at Bonita. Like his current cast of players he’s always looking to improve or add new wrinkle to his game. Like a pair of jeans or old iron skillet, he seems to improve with age. In particular, he has learned to handle critical end-of-game situations better, when every last detail matters. In that regard, he’s now thinking about the early schedule. 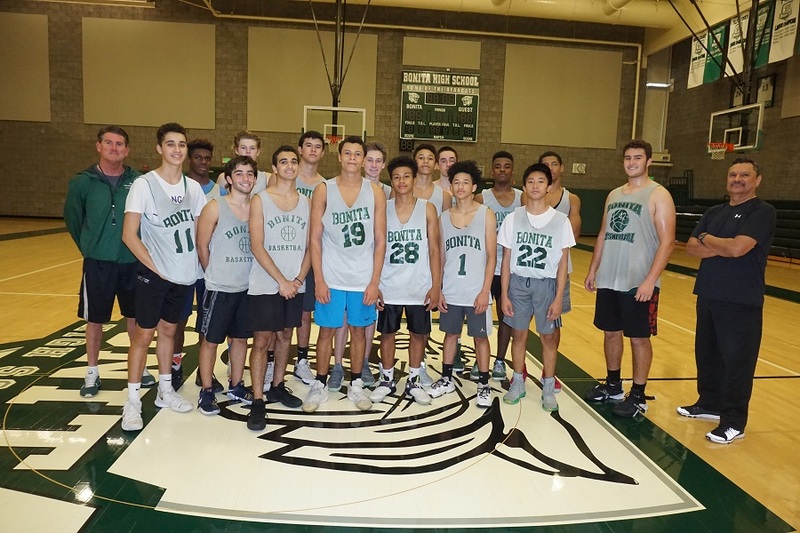 Bonita scrimmages against Jserra on Nov. 21. Other early-season highlights include hosting a team from Perth, Australia on Dec. 11 and traveling across town to meet San Dimas on Dec. 19. A winded James Smith is out to prove he can still make a free throw even after practicing for more than two hours straight. If history is any indicator, Tim will have his God-Squad ready to compete at the highest and most ethical level. 986 Pharmacy in La Verne and La Verne Realtor Colleen Bennett will be helping LaVerneOnline.com cover the action all season long. 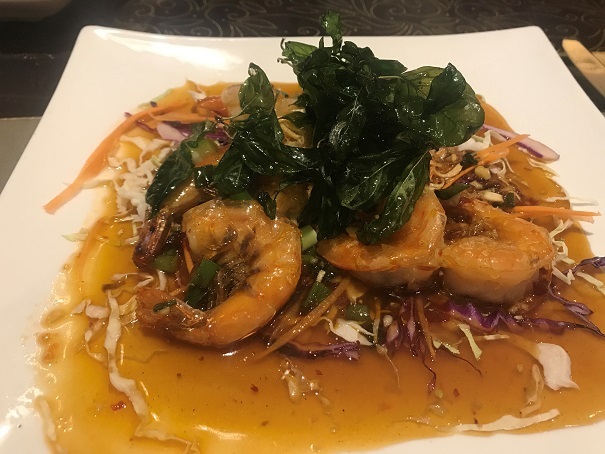 For pre-game and post-game meals, stop at Taste of Asia, where Virada always serves up something special. Taste of Asia never scrimps on the shrimp. Enjoyed a “Taste” after interviewing the coach.